Sometimes, it can feel like you and your cat speak different languages. The truth is, to some extent, you do. Many times, humans use treats and food to show their cats love. And an occasional small treat is okay, but it's good to have some other ways to show affection that your cat will understand. Too many treats or too much food can lead to weight problems and then other health conditions like diabetes and heart disease. So if you want your kitty to understand your affection for him beyond a shadow of a doubt without using too many treats, here are some things you can do. Have you ever been gazing into your cat's eyes and seen him slowly blink one or both of his at you and then open them again just as slowly? 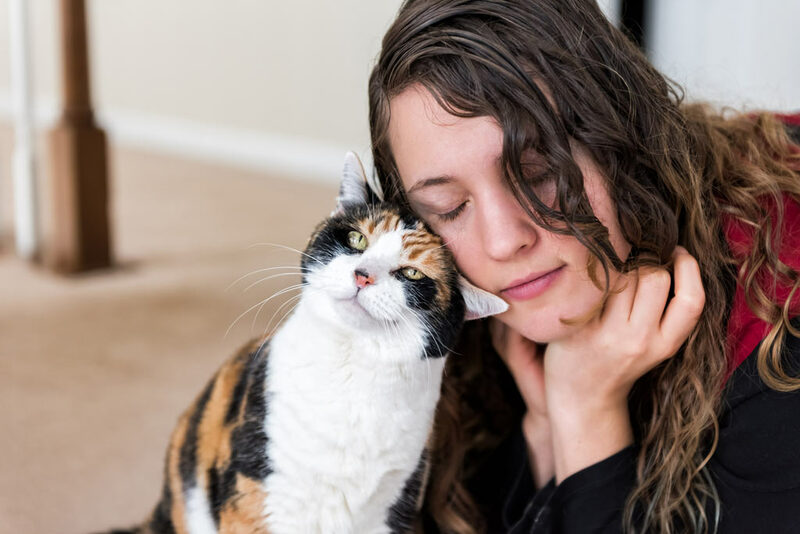 That's a slow eye blink—a kitty "eye love you"—and cats do it for each other and their humans as a sign of affection when they're feeling relaxed and happy. You can do a slow eye blink at your cat, and he'll understand that you're telling him you love him. Cats are predators and stalking, chasing, and pouncing on prey makes them feel happy and secure. Our indoor cats don't get as many chances to be predators as they'd like. But you can provide that mentally and physically stimulating activity to your kitty, and he'll feel loved and happy when you do. The way to give your cat opportunities to practice being a predator is to provide regular play time using interactive cat toys. Those types of toys allow you to simulate a bird or mouse so your cat can chase and pounce. When you are pretending to be prey, think about how a bird or mouse would move while a cat was chasing it. They don't go toward their predator. They run, skitter, try and hide, and sometimes, they freeze. Don't forget that, at the end of the play session, your cat should have the success of catching the "prey." Toss a stuffed toy toward your kitty and let him sink his claws and teeth into it. Afterward, give him a tasty treat, just like he'd get at the end of a good hunt. 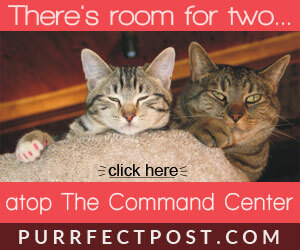 Learn more here: "Interactive Play with Cats." Cats need to scratch. It helps keep them physically and mentally healthy (learn more: "Why Cats Scratch.") 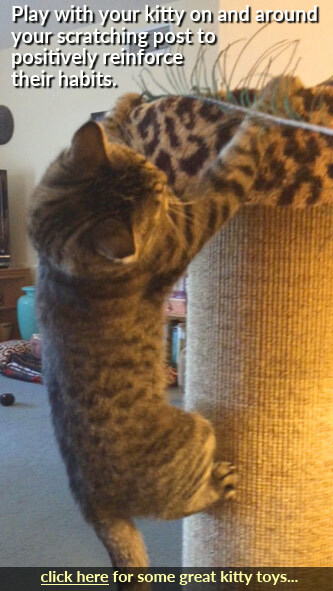 Providing plenty of good-quality cat scratching posts—covered in material cats love to scratch like sisal fabric or corrugated cardboard—helps kitties feel secure and loved. Make sure you have a variety of sturdy cat scratching posts in different configurations, such as tall ones, trees, and angles. Keep one near your cat's favorite sleeping spot because cats love to scratch when they first wake up. Make sure you have good scratching posts in high-traffic areas of your home because scratching is a way that cats mark their territory and show others their space. Being able to do so helps them feel happy. One great way to show someone you love them is to pay attention to what they like to do and give them a gift associated with it. It's no different when you're showing your cat you love him. Cats enjoy sleeping. They like to curl up in a beam of sun and snooze for hours. 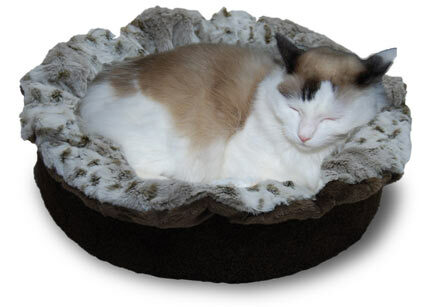 Providing your cat with extra cozy cat beds wherever he likes to sleep is a great way to show love. Cats also like to be in small spaces like cardboard boxes or cupboards. It helps keep them warm and lets them feel unseen while they're observing what's going on around them. Cats can usually find their own hiding spots quite well, but you can show yours that you're paying attention to his love of small spaces by giving him a cardboard box or buying him a Cat Cave. Just like with your human loved ones, giving your cat time with you is the best way to show you love him. If your cat likes to snuggle, spend time every day indulging him. If you find yourself pushing your kitty off your lap because his claws poke into your legs when he makes happy paws, consider getting a Muffin Blanket to use between your lap and him. They're super soft and act as a barrier for claws while helping to keep fur off your pants. It might surprise you to learn that cats can experience discomfort or pain when they eat and drink out of certain bowls. Their whiskers are highly sensitive, and whisker fatigue can occur if they must use a dish that is narrow and deep, continually pushing their whiskers backward. A broader, shallower bowl decreases or relieves this problem and allows cats to eat and drink more comfortably. Also, cats usually prefer drinking from running water sources instead of stagnant ones. That's because, in the wild, running water sources are usually safer than non-moving sources, where bacteria can gather. 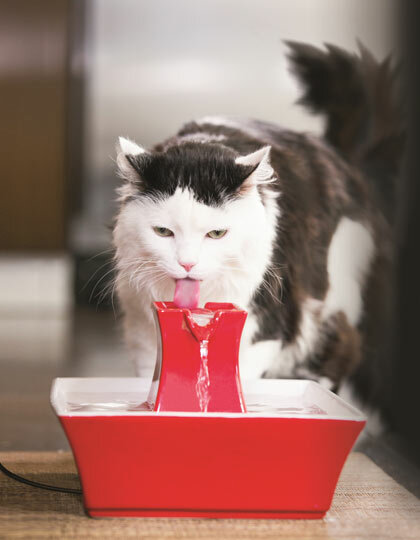 A water fountain is a great idea to help cats drink more water. Cats prefer having their water and food in separate areas. In the wild, having their food source too close to their water can mean contaminating the water supply, so cats drag their kills away from nearby water. Place your kitty's water and food dishes in separate areas to show him you care about his preferences (and encourage better water consumption, which is good for his health).